We recently heard of someone's design being award eligible. Got us thinking. From this point on all of Design Hovie Studios' work is officially declared award eligible. Let's see how that works. 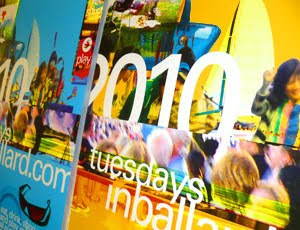 Design Hovie Studios is once again doing the design work for the Tuesdays in Ballard summer campaign. 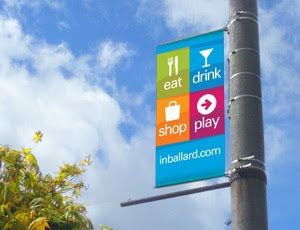 This year the organization, In Ballard Merchants Association, has been awarded a City of Seattle grant to create and install light pole banners throughout the Ballard neighborhood. Hovie has designed the new banners using the colorful and eye catching eat, drink, shop and play graphics from the inballard.com web site (also designed by Design Hovie Studios). The web site URL is also prominently featured since the site will include daily Specials and Events to be found in Ballard.